I came across this puzzle in Arthur C Clarke's novel "The Ghost of the Grand Banks". In one of the several sub-stories the young daughter of some very bright parents gets into trouble at school. 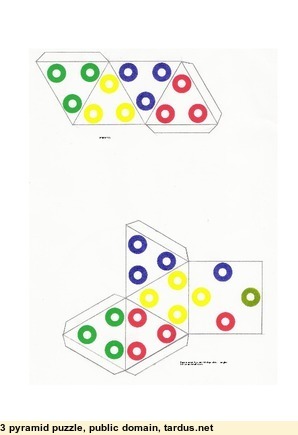 The teacher gave them a mental puzzle - if you join 2 tetrahedrons together, how many faces does the result have. 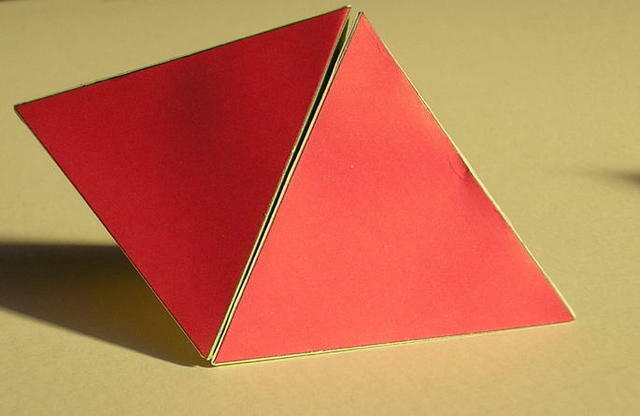 Now a tetrahedron has 4 faces, all equilateral triangles (ie, all angles 60 degrees). The correct answer is 6 (4 + 4 -2 faces that join and are lost in the interior). 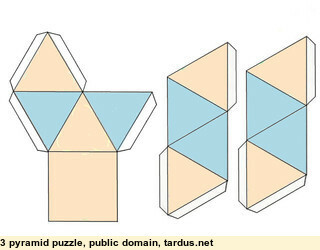 Then came the second puzzle - if you join 1 tetrahedron and 1 square based pyramid (whose triangular faces are also equilateral triangles) how many faces are left? All the kids answered 7! (4 + 5 -2), except for the girl in question, who said 5. She refused to retract her answer, and was accused of stubbornness and just being plain difficult. A letter was sent home. While mum was trying to comfort the sobbing girl upstairs, dad got out scissors, glue and paper and made some models. What do you know! The answer is 5! 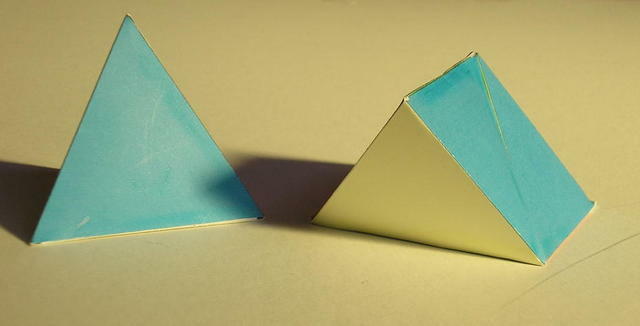 If you make 2 tetrahedra and put them on opposite sides of the pyramid, how many faces then? You might be surprised. If you are adventurous, make a second pyramid, then add it on - tetrahedron, pyramid, tetrahedron and pyramid. How many faces then? 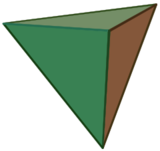 BTW, I discovered along the way that the internal angle between opposite edges of the pyramid (provided it has faces that are equilateral triangles) is 90 degrees. 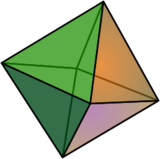 If you put 2 such pyramids base to base, you end up with an octahedron, yet another of the Platonic solids. 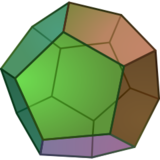 It is fully symmetrical, so all its internal angles must be the same, and the "base" angles are 90, so all the angles are 90 degrees. Here are the models I drew up myself - a little rough in the drafting, done pencil and paper. 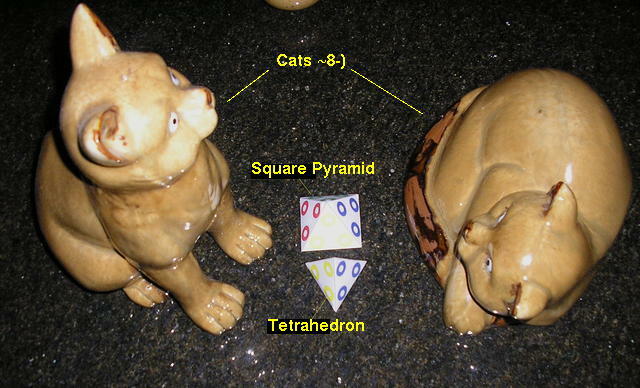 The tetrahedron is the simplest of the 5 Platonic solids, named for the ancient Greek philosopher Plato. Each one has all its faces identical, and all must be regular polygons, ie, all angles and side lengths the same. This also means that all its angles are the same. 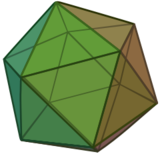 There is a good article on Wikipedia http://en.wikipedia.org/wiki/Platonic_solid which includes animated rotating images of the 5. Here are small images, taken from the Wikipedia site.